As school exams get underway there’s a lot of stuff being digested in teenage bedrooms all over the country. I don’t just mean chocolate hob-nobs, but maybe some geography, german and algebra too. Are modern kids prepared for the money world? However, one subject that’s notably absent from the modern curriculum is financial literacy. In a couple of years hoards of these youngsters will be managing their own finances, perhaps while saddled with student loans. And research shows that a big chunk of them won’t understand the money basics, like the difference between AER and APR or how compound interest works, by the time they reach adulthood. That’s why I welcomed the launch this week of a website aimed at helping kids understand money. Moneyasyougrow.org is a site that features 20 essential money milestones that kids go through from the age of three to eighteen. OK, it’s a US site but loads of the common sense stuff applies here too. 15 – 18 year olds are advised to use cash rather than credit cards for purchases and the over 18s are told they should only use a credit card if they can pay off the whole balance in full every month. Many of the money problems we see in adults have their roots in childhood. So many of us had little or no financial education as kids and grew up into financial illiterate adults. Others had parents who handed down such strict money rules that money strikes fear in them years later and they avoid responsibility. One way to stop this pattern repeating itself if you have kids is to start a simple money education as soon as they are old enough to reach up and hand their pennies over the sweetie counter. 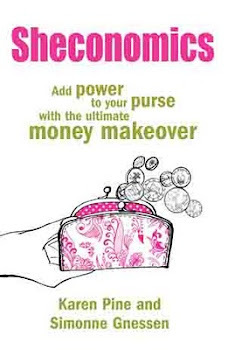 The moneyasyougrow site is a good place to start; there are also lots of tips in Sheconomics. What ‘price’ do you put on being fashionable? Fashion theorists often debate whether fashion liberates or enslaves women. Arguably, all fashions are enslaving. But some are more enslaving than others. Tight skirts restrict free movement. according to Professor Mary Beard. High heels make walking difficult and running nigh impossible. And then there are nail extensions. 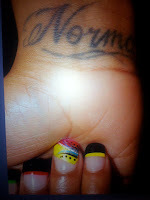 Nail extensions strike me as the most enslaving of all current fashions. Just when we’ve become liberated to the point where we can do virtually anything men can do, we go and turn ourselves into Edwina Scissorhands. In fact, the practice of affixing acrylic appendages to the ends of women’s fingers strikes me as the modern equivalent of foot-binding. without causing anybody grievous bodily harm. I defy anyone to do any of those things in one-and-a-half-inch rock-hard chiselled and lacquered nail extensions (OK I just defy anyone to do the last one). At the risk of getting my eyes scratched out, I would say any fashion that involves physical bonds is over-priced. Not just monetarily but in the treasured moments of life sacrificed for it. I'm all for adornment, just not into self-crippling or self-handicapping adornment. The Body Adorned exhibition at the Horniman Museum explores how people clothe and adorn their bodies, with a special focus on London. Over time, saris, tattoo parlours, nail bars, distended ears and scarification have become a visible, everyday part of the London cityscape. But how did cultural adornments become integrated into urban London life? This exhibition invites you to look at how you dress your body and why. It’s well worth a visit.